There's still time left in the Goodreads Switch-A-Wish Giveaway. Enter for your chance to win by midnight, January 2016. It only takes a few seconds to enter. Good luck! Giveaway ends January 01, 2016. Switch-A-Wish Review: "I Loved This Book. Loved. It." "Ooo...Ooo...Ooo! Is it bad that all I can do is make delighted sounds as I am preparing to write my review for Switch-A-Wish by author M.B. Earnheardt? I hope not, because I did, and this book certainly deserves all of my excitement! This is the story of married couple Chris and Amanda Claridge, a familiar couple to many of us: perfect seeming on the outside, resentful and unhappy on the inside. Handsome Chris is a college professor, pretty Amanda stays home with the couple's family. The two are headed for a divorce until they magically find themselves truly in the other's shoes the morning after making a wish for that very thing to happen. Through this unusual experience, they are each able to gain an understanding and appreciation for the other that wouldn't have been possible otherwise. Will their love for each other return as well? You'll have to read the book to find out! I loved this book. Loved. It. The storyline grabbed me from page one and wouldn't let go. Author M.B. Earnheardt was able to delve deep into the heart of many marital problems, our inability to appreciate fully what the other does for us, and present that problem in an oh-so-readable way. Any reader who enjoys a fun read of women's fiction, chick lit, or just a great read in general should absolutely buy this book. I highly recommend Switch-A-Wish and will have my eyes peeled to see when M.B. Earnheardt's next book will be released. I, for one, will be in line to buy it as soon as I possibly can!" Click here to read more reviews of Switch-A-Wish. Visit Goodreads beginning midnight, Monday, October 26 through midnight, November 23 for your chance to win one of 10 free paperback copies of Switch-A-Wish. Chris and Amanda Claridge are that couple. They look happy. They live in a well-kept home, have three little girls and fit squarely into the roles of husband and wife. Chris is a handsome college professor who easily charms everyone he meets. He loves his job and can't wait to go to work everyday. Amanda is a dedicated mother and caretaker. She tends to the kids and appreciates how important her job is, even if others don't get it. Underneath the surface of this functioning family, things are unraveling. Marital problems are about to split them apart when something magical happens.Chris and Amanda make a bedtime wish that forces them to live life as the other person. Chris must pretend to be his wife as he takes on childcare and household chores. Amanda steps out of her heels and into her Chris's shoes to tackle his job as a college professor. The role reversal is a revelation for the couple. Neither one has it as good, or bad, as they expected. Can Chris and Amanda make it past the secrets they have kept from each other? Will this new perspective give them the chance to find their way back to love? Winners are encouraged but not required to review the books they win. In compliance with FTC guidelines, if you review Switch-A-Wish, please disclose in your review that you received the book for free through Goodreads Giveaways. In the lead up to Tuesday's "official" launch of the print edition, Switch-A-Wish is on sale on Amazon. Save 10% when you order the print edition. Okay, it's a whopping $1.20. But that's a large coffee at the local gas station (and everyone knows, gas station coffee is yummy). Shhh... I have a secret. The paperback version of Switch-A-Wish "officially" launches in one week, Tuesday, October 27. But you can get your copy today by click here. Also, if you're on Goodreads, click the "Add Book" button below to add Switch-A-Wish to your reading list. 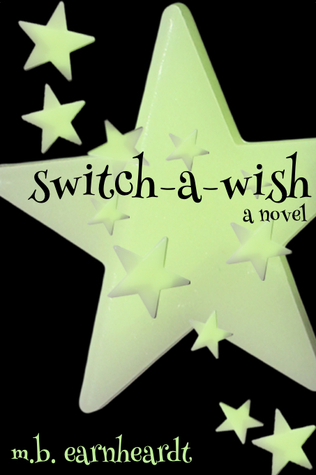 If you're on Goodreads, and you've already read Switch-A-Wish, please consider leaving a rating and review. Thanks! I've heard from a few groups intending to use Switch-A-Wish as a book club read. This is exciting, and very flattering. To help guide book club discussions, I've put together a list of questions. Feel free to use them, alter them, and of course, add your own. Please share your questions with me (and others) in the comments sections of this post. If your club is local to Northeast Ohio (Pittsburgh to Cleveland, Erie to Columbus), I'd be happy to visit your group. If you're not local, I can Skype in to one of your meetings. 1. The book focuses heavily on empathy (the ability to share and/or understand the feelings of another). Why do the characters find themselves so out of touch with each other and how does the empathy they cultivate in the book bring change to their relationship? 2. Who had the better strategy for dealing with the problems in the relationship before the wish? Was it Chris who wanted to stay married, but was looking to find fulfillment of the needs he felt his wife couldn’t fulfill? Was it Amanda who wanted to end the family and start fresh? 3. Switch-A-Wish adheres closely to traditional patterns in a marriage (wife at home with kids, husband working outside of home). Are these traditional roles important to the story, or would Switch-A-Wish have worked if Amanda worked outside the home and Chris was the primary caretaker? 4. What does the book tell us about the life-cycle of romantic relationships? 5. How did relationships with other characters (friends, family) impact Chris and Amanda’s understanding of each other? 6. Thinking about Chris and Jenna’s relationship,clearly he handled it poorly. What would you have done differently? Would you have ended it differently? 7. Thinking about Amanda and Linda’s relationship, did she handle it poorly? Would you have treated Linda differently? 8. Who is someone you would want to switch places with? What would you picture your switch looking like? What’s one thing you would be excited to do as the other person and one thing you would dread the other person learning about your life? 9. Did Chris and Amanda stand a chance at staying together without the wish and switch? What would have happened if they never switched back? When they try to switch back at the end, will the wish work again? What more would they hope to learn about each other? Thanks to all of you who downloaded and read (or are reading, or plan to read) Switch-A-Wish. I love hearing your reactions and reading your personal messages about the book, and I promise to respond to each and every one. I'm hoping you might take your reviews of Switch-A-Wish one step further. For each person who posts a review of Switch-A-Wish on Amazon or Goodreads in the next week (by Monday, October 12, 2015), I promise to send you a print copy when it's officially launched in late October. When you post your review, email me at mbearnheardt@gmail.com or head over to my Facebook page and leave a message. Please be sure to include your address in an email or private message to me so we can be sure to get you a print copy. Thanks again for all the wonderful things you're saying about Switch-A-Wish. "A solid 4 1/2 stars for M.B. Earnhardt's debut novel, Switch-A-Wish. She has woven an intriguing story..." read more at Goodreads.com. Get your copy on Amazon, or click on the "Book" link to find more options for getting your copy.